This past weekend, we went to a pumpkin farm with Namine’s cousin. For the past few years, we’ve been going to Smith’s Pumpkin Patch. They have some pretty awesome decorations, face painting, and food. We always have a great time. Star Wars pumpkin people. Namine's favorite was Rey. Of all the options posted on the sign, Namine's pick was "Frozen." 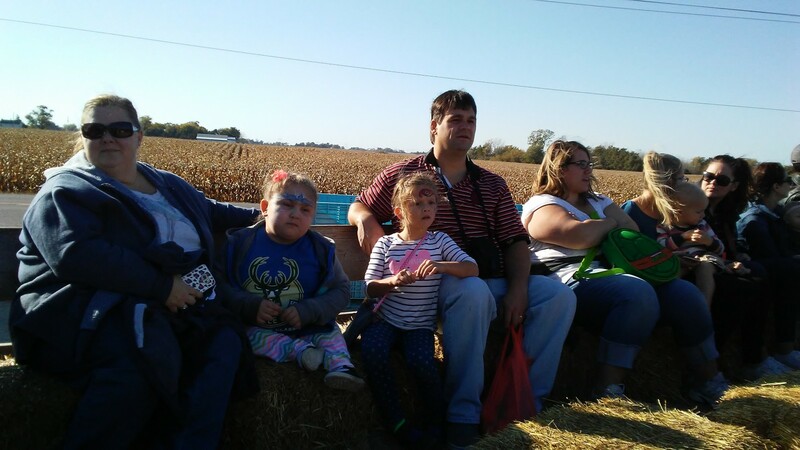 Namine and her cousin wanted to go in the corn maze, but an adult needed to go with them. I drew the short straw. (Who am I kidding, I wanted to go in as much as they did!) Despite the unevenness of the ground, Namine was able to wheel herself most of the way. Her cousin walked ahead, moving corn stalks and sticks out of her path. It's a corn maize. Get it? Because corn is... never mind. And how could we forget the hay ride?